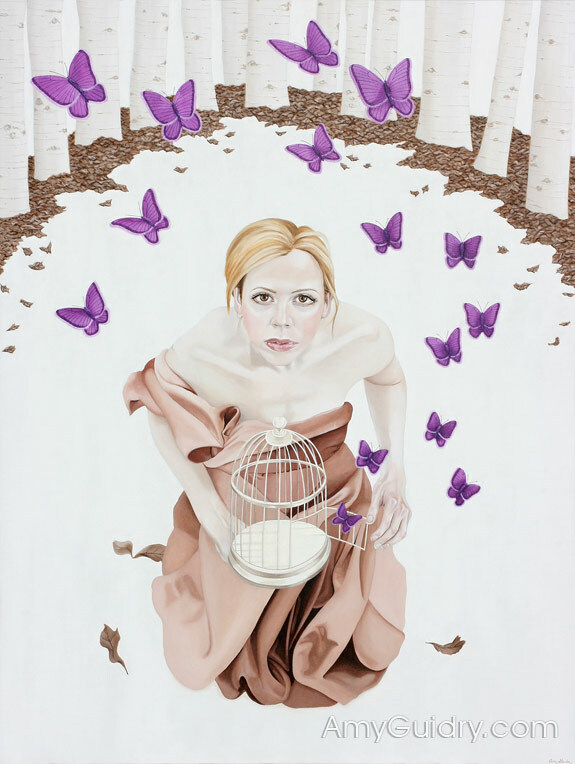 The premise of "New Realm" is to challenge antiquated views of women as often seen in fairy tales. The series explores strength of character and independence. Using a surreal backdrop, this modern tale presents the heroine as a strong and courageous woman. The viewer is invited to follow along as the story unfolds. Various symbols typically associated with femininity are woven into the series. Symbols ranging from high fashion to butterflies serve as representations of modern women. With their haute couture design, dresses, while being considered feminine, symbolize the heroine's ties to royalty. The modern fashions thus bring the story into a more current context. Birds and feathers allude to flight and freedom, in both a physical and emotional sense. Butterflies represent growth and transformation which are witnessed through the story's heroine and through women in general. No longer sheltered, the heroine proves that women are strong and independent.